have you seen this new show on A&E? wow – i am completely addicted to this show!!!! 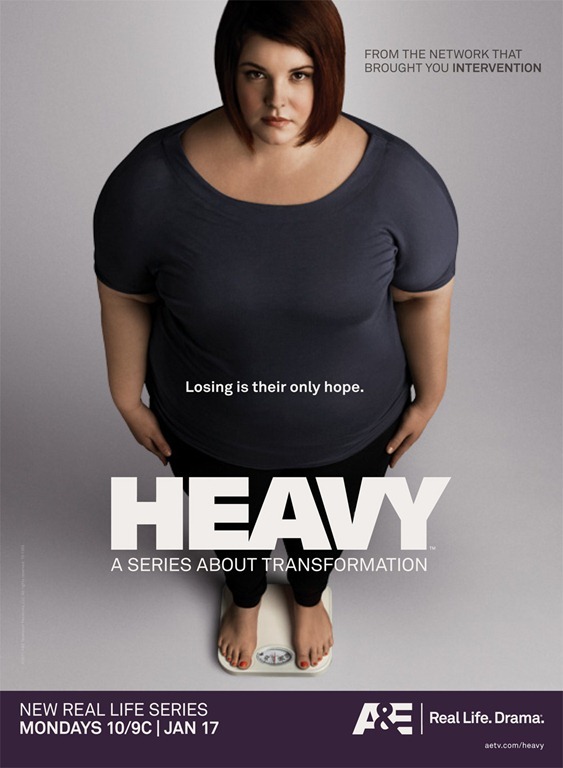 they take 2 very obese people who are ready to change their lives and send them to a facility for 6 months. They go through counseling, taught how to make better food choices and pretty much go through a boot camp type of exercise regime. i watch what they do and think – wow, i have no room to complain or say i am too tired, or to even utter the words, “i can’t do that”! Last nights show was the season finale. The guy Chad went in weighing over 500 pounds, and the woman Sallie i believe weighed about 450 pounds. both were looking for huge changes in their lives. they tell you their stories, you “meet” their families. you watch them slowly succeed and it’s just so amazing!! i don’t know how many times i got all girly like and got teary eyed. These two completed a triathlon!!!! Can you imagine? Sure, they had lost alot of weight at that point, but still…carrying around over 3-4 hundred pounds…swimming, then biking 6 miles and then running 5 miles…that’s INSANE!!! People will argue, that these people are sent away for 6 months and thrown in a controlled environment. of course they will succeed. that is a half truth. yes, they are sent away…they are taught all the things they need to know in order to succeed…given the tools to be successful. they have professionals there to watch them every step of the way. remember, these are people who don’t even know where to begin when it comes to eating healthy and exercising. the people who go on the show still need to do the work – no one is working out for them…they are just being taught how to do it…so they can take those tools out in to the real world. i get so uppity when people think it must be so easy for them…because i can only imagine that this is the hardest thing they ever had to do in their lives! i believe at the end of the 6 months, they both lost approximately 140 pounds. Also, they give you an update after a few months…and both were still working out, eating healthy and losing weight. these are such awesome feel good stories it makes my heart want to burst. there is an update show coming up about other people that were on the show…i cannot wait to tune in to that! This entry was posted in health, journal, weight loss and tagged A&E, blog, blogging, comfort eating, diet, emotions, fat, feelings, food, food issues, gym, health, heavy, journey, obese, personal, reality show, success, weight loss, working out, writing on March 29, 2011 by losing bee. I watch it, too, Bee—I taped yeserday’s and plan on watching it tonight. Thosep people aer truly inspiring.That place looks fabulous, doesn’t it? oh Susan, hope i didn’t give too much of it away!!! it was a great episode…and yes…u can send me there any day! i totally agree with you jm! I’ve watched that show too and even blogged about it (http://project180degrees.wordpress.com/2011/02/13/day-341-heavy-thoughts/) but I think it left me feeling self-conscious. I’ll stick to The Amazing Race and Bethenney Ever After, I guess. i have never heard of Bethenny Ever After…what is that? thanks! i am going to have to google her then!